First operational trials in Europe, one month long, took place in October 1970 at Canadian Forces base Baden-Söllingen (Germany), stopping at Goose Bay, in Greenland and Iceland. 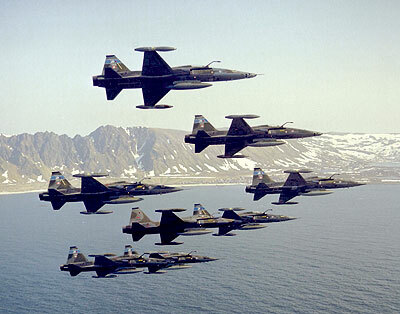 Six CF-5As from 433 and 434 Squadrons, tasked with the defence of Norway in the event of hostilities, undertook close support, armed reconnaissance, interdiction and aerial combat roles not carried out by Canadair CF-104. Freedom Fighter from 433 and 434 Squadrons participated 21-02-71 at Frobisher Bay (now Nunavut) and Whitehorse to an excercise to test the aircraft's winter weather capabilities. During May/June 1971 433 Sqn took part, together with 434 Sqn, to an exercise in Europe involving the transfer of 6 CF-5As. They stopped on the way at Prestwick and went on to Norway. Before going on they visited RAF Marham to carry in-flight refuelling trials with RAF Victor K.1A No 55 Sqn tankers, as Canadian Forces Air Comman had no tanker on strength. The same year saw the deployment of six CF-5A to Germany, transiting Prestwick on 16-11-71 on their return flight to Canada, coming from Baden-Söllingen CF-104. On June 6th, 1973 8 CF-5A, CF-5A(R)s from 433 and 434 Squadrons flew from Bagotville to Andoya (Norway), being refuelled in flight by 2 Boeing CC137 tankers of the 437 Squadron, to participate to a NATO excercise. This was the first non-stop transatlantic deployment. Four CF-5A/CF-5A(R) tansited Lossiemouth on 09-08-74 to participate to a NATO reconnaissance excercise at Leck (Germany) from 02-09-74, accompanied by one Boeing CC-137 tanker. Two Canadair CF-5A(R) from 433 Squadron visited Leeuwarden AB (Netherlands) on 06-10-74. Another transfer to Rurope took place in September 1977, when 8 Canadair CF-5A from 433 and 8 CF-5A from 434 Squadron pased through Prestwick (UK) on 25-27 September. Canadian In February/March 1978 8 Canadair CF-5A from Bagotville went to Northern Norway to participate to NATO's "Artic Express" excercise joining British, Italian, German, Dutch sea. land and air forces to test rapid deployment procedure of the Allied Command Europe - Mobile Force. From May 26 to June 03, 1978 433 and 434 Sqn, each with 4 CF-5A(R) were based at RyggeAB (Noway), with deployments to Stavanger and Bergen, for Best Focus 1978 exercise. They returned to Canada through Prestwick (UK) between the 3rd and the 6th June accompanied by an Boeing CC-137 air-refuelling tanker. 434 Sqn was present at the reconnaissance meeting in Eggeberg (Germany) bewtweeb May 30th and June 6th, 1980 with nose-camera equipped CF-5As, together with Norwegian RF-5A, Danish RF-35 Draken, German AF RF-4E participated to Best Focus exercise. From February 28 to March 27 1980 Anorak Express excercise took place in Northern Norway; 8 CF-5As belonging to 433 Sqn were part of the Canadian contingent, as usual in-flight refuelled by a Boeing CC-137 tanker during the transfer to Europe and back. During June 1980 434 Squadron was present at the reconnaissance meeting in Eggebek (Germany) with 3 Canadair CF-5A(R)s.
Beginning of December 1985 saw the overflight of 434's Sqn CF-5As from Chatham to Norway to participate to a NATO excercise, being in flight refuelled by Boeing B.707/CC-137, serial 13704. 434 Sqn participated with its 10 CF-5As in September 1986 at the excercise Brave Lion taking place in Norway. Final detachment to Europe took place in 1987 when 4 CF-5A, 434 Sqn, arrived at CFB Baden-Soellingen on 14-04-87, returning to Chatham from Stavanger on 28-04-87, as usual supported by 1 Boeing CC-137 air-refuelling tanker. In June 1988 the CF-5s were removed from NATO's Rapid Reinforcement Force, replaced by CF-18s from 433 and 416 Squadrons. Red Flag is a complex international excercise taking place in the Nevada desert, aircrafts mainly based at Nellis AFB, two times a year. In 1977 Canadian CF-5As participated for the first time Red Flag combat training exercise involving the air forces of the United States and its allies. The edition 82-1, between mid-October and mid-November 1981 saw the participation of 12 CF-5A, CF-5A(R)s and 5 CF-5Ds; in January 1983 434 Squadron sent 3 CF-5As and 3 CF-5A(R) to Nellis. No 434 Squadron participated with 7 CF-5As and 2 CF-5D at Red Flag 84-2 between January 07 and February 18, 1984. Last participation to Red Flag exercises was in January 1989 when at least 4 CF-5s from 434 Squadron were sent to Nellis AFB. Transfers to Nellis were non-stop from 1972, with air-refuelling when Boeing CC-137 had been converted to tankers. This is a similar excercise to Red Flag but, as the Canadian scenary is by far more similar to the European one than the Nevada desert, by more realistic to an eventual European battle ground. CF-5s (two-seaters from 419 Sqn) participated for the first time to Maple Flag held between April 24 and May 20 1978 at CFB Cold Lake and its enormous Air Weapons Range, together with Canadian CF-104, CF-101, as well as USAF (inclusive F-5Es) and US Navy units. This excercise was a great success and it was from then on repeated bi-annually with the participation of CF-5As and CF-5Ds of both 419 and 434 Sqns, some of them painted in Aggressor colours. Maple Flag III, from April 28 to May 28 1979, saw the participation of both Cold Lake of all CF-5 equipped Sqns, together with Canadian CF-100s, CF-101Bs, CF-104s, USAF 5 F-5Es of the 57th Wing, F-4Ds, RF-4Cs, F-15As and US Navy F-4s plus transport aircrafts and helicoters. 434 Sqn aircrafts flew all kind of missions, ranging from reconnaissance to interception, while 419 Sqn supported in the aggressor role. Mape Flag VII, beginning 1981, hosted two 419 Sqn two-seater and four 433 Sqn single-seaters. No 419 Squadron, as only CF-5 unit left, took part with CF-5As and CF-5Ds to Maple Flag taken place between April 29 and June 10, 1989. Long distance navigation flights to USAF bases were undertaken by 433 and 434 Sqn CF-5A and CF-5A(R), for example to Hill AFB in April 1973, Nellis AFB 27-02-75, Davis Monthan AFB in -05-75, Williams AFB -03-76, in April 1977 to Hill AFB, to Andrews AFB on 12-04-80. January 1978 saw a rather unusual operation. On 24-01-78 the Soviet ocean surveillance satellit Cosmos 954, with part of its components highly radioactive, crashed in the area of the Great Slave Lake. Four CF-5, equipped with photo reconnaissance nose, flew photographic missions to provide searchers working in that area with detailed photographs in order to aid in the discovery of spacecraft debris. One Boeing CC-137 was deployed to provide in-flight refuelling to extend their stay in the photographic target area.